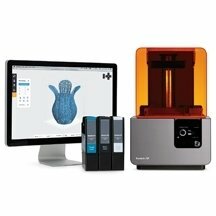 Stereolithography (SLA) is the 3D printing technique most used in the professional environment. This revolutionary process consists of a photosensitive resin liquid tank which is photo-polymerised by a laser beam. SLA 3D printers operate by solidifying (photo-polymerising) the resin using a laser. SLA technology (stereolithography 3D printing) lets you create very fine pieces via 3D printing, and rapid prototyping using an ultra-precise laser that scans the details of the model to be printed. Stereolithography (SLA) is a revolutionary printing method allowing professionals to print numerous parts in liquid resin, in record time and with more satisfactory results. As for DLP (Digital Light Processing) printers, they project a layer of the piece to be printed via a projector, and these layers, just a few microns thick, are exposed to light one after the other to solidify the liquid resin until the item is completed on the DLP printer. These 3D resin printers using stereolithography are the most accurate on the market because the projected light rays are extremely fine and the results achieved in terms of finishing and surface quality are better than filament deposition printers (limited by the nozzle of the 3D printer). Buy resin printers, buy SLA stereolithography 3D printers: all 3D printers are guaranteed for one year. Advice and guidance for secure online purchases in our shop. Use our online comparison tool to compare several SLA stereolithography printers or DLP printers and find the product that best suits your needs. 5 234,40 € Tax incl. 5 810,26 € Tax incl. 6 812,11 € Tax incl.